Living in London, I’ve never done a London bus tour. I mean, obviously. I’m far, far too cool for that sort of thing. Just as I’ve never seen the crown jewels, eaten at the Rainforest Cafe or visited Madame Tussauds (at least, not since I was 14 and hosting a perpetually bored French exchange student). But throw in a six-course meal and it’s an entirely different proposition – at least, that’s what I’m telling myself as I wait at Victoria Embankment on a crisp autumn evening for the arrival of Bustronome, the capital’s latest offbeat attraction. 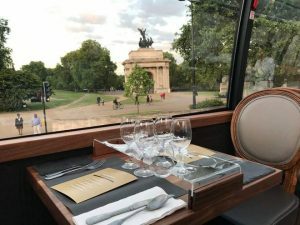 Combining a traditional tour with an upscale dining experience – lunch, afternoon tea or dinner – Bustronome has been going in Paris for a few years, and brought its concept of a souped-up bus with the top deck converted into a swish restaurant to London for the first time this summer. 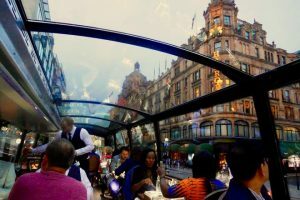 After admiring the sleek black exterior, we ascend the steps to find intimate booths, floor-to-ceiling windows and low lighting; Edith Piaf’s distinctive crooning wafts through the speakers and we’re handed a glass of champagne. So far, so bon. We’re handed menus that double up as our tour guide for the evening, unfurling to show a map of the route we’ll take; each attraction is picked out with a matte gold dot. Yawn, I think, looking at London’s landmarks spilling out across the card – Tower Bridge, the Royal Albert Hall, the Houses of Parliament. I live here, I see these places all the time. What could I possibly need to know about them ? I’ve already resigned myself to the fact I’ll largely be ignoring the familiar world outside my window, viewing it more as a moving backdrop to the main event: those six courses. 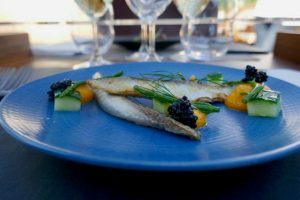 My worry that the food might be a let down – that, in fact, the whole Bustronome premise relies on a cheap gimmick – is quickly dispelled as we tuck into our first dish of artichoke carpaccio with hazelnut. Glossy, translucent slivers are subtly flavoured with oil and countered by a smattering of leaves and edible flowers. The bus rumbles to life, but I barely glance up from my meal. The whole thing is cleverly arranged to mitigate the jolting of a moving vehicle. Magnetic placemats keep the cutlery stable, while clear Perspex stands hold wine and water glasses steady – something I appreciate as I’m topped up with one of the loveliest sauvignon blancs to ever grace my palate. As the bus ambles along (thankfully travelling at a much slower pace than a regular London bus), course number two is delivered to the table – grilled tiger prawn on a bed of melt-in-the-mouth pumpkin – and I properly look up for the first time to see St Paul’s Cathedral in front of me. Maybe it’s because the building is lit up dramatically against the inky sky, maybe it’s because I’m seeing it from a new perspective after half-forgetting where I am, but I am struck between the eyes with just how drop-dead gorgeous the Grade I-listed masterpiece is. I’m thrown so off-kilter by the experience of seeing something numbingly familiar in a new light that I find myself reaching for the audio guide, tapping it on the appropriate dot, and listening, spellbound, as it informs me that this was the second attempt at St Paul’s Cathedral – SPC mark I burnt down in the Great Fire of London. I soon discover how ignorant I am about the most celebrated attractions of the city I call home. Did I know that the London Eye was much heavier than intended after construction and that figuring out how to raise it and keep it rotating was a genuine feat of engineering? That the Royal Courts of Justice are guarded by a bronze dragon? That the Beefeaters at the Tower of London are also known as Yeomen Warders? No, no and hell no. As a gourmet-style fish and chips course is replaced by meaty tuna steak, parsnips and roasted tomatoes on the vine, I find myself feeling pleasantly like a tourist in my own stomping ground. We cross the river and Tower Bridge glitters in the distance; lights are reflected in the still water, creating a perfect mirror image. By my second glass of wine and fifth course – strips of mature cheddar accompanied by a thick port dipping sauce – all cynicism has dropped away. I’m grinning up at the gaudy Harrods shopfront, all lit up like a Christmas tree on a sugar high, thinking I’ve never seen anything so romantic. The queue of traffic around Trafalgar Square looks comforting through the flattering fug of exhaust fumes. Those giant, moving Piccadilly Lights? Charming ! Dessert is as sweet as my mood, with zingy “deconstructed lemon meringue pie” (think smooth citrus fool with a crunchy topping) on the menu, while my head is turned by just how ornate the Houses of Parliament are when you really look at them (rather than tutting at them when elbowing your way past a stationary herd of camera-wielding tourists). And with that, three hours later, we pull in next to the Thames, the river I’ve seen every week for the last 10 years without ever really seeing it. We may be back where we started, but I feel like I’ve come a long way. Falling in love with a city is easy. But falling back in love with it after a decade ? That takes a bus, six courses – and a whole new perspective.